Uncle Bob and I had a garden chat yesterday afternoon. He seemed a little down; he predicted an end to the garden. Uncle Bob keeps garden records on his kitchen calendar and saves his calendars from year to year. He’s quite a statistician. He said his cucumber production is down two-thirds from last year and he’s only got two pumpkins coming. He’s not talking about the corn yet. On a brighter note, he’s been eating string beans every day for over a month. I decided to cheer him up. My sunflowers are growing tall. I picked one for Uncle Bob and put them in a vase on his porch. He’s so funny; these flowers will dry up and die and he’ll leave them there until I come home to refresh them. 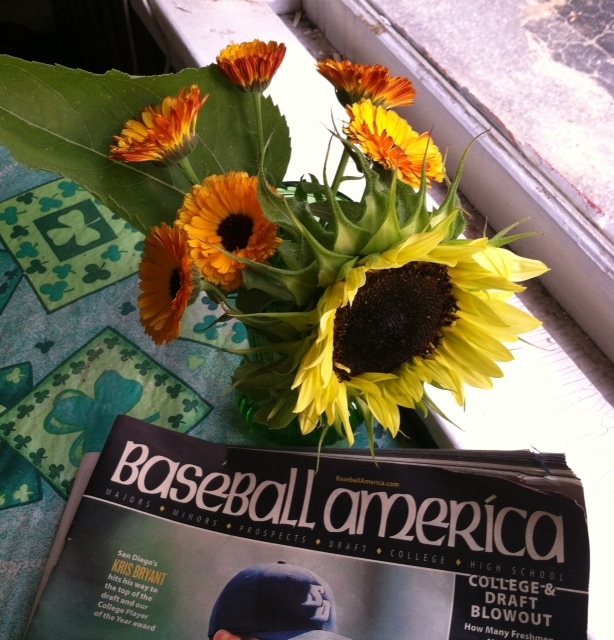 As I was arranging his flowers, I noticed he had a current issue of Baseball America on the table. The publication’s motto is “Baseball news you can’t find anywhere else.” Sometimes, I forget that Uncle Bob is a real person with passions and interests. He’s not just a character on my blog. Baseball is one of his passions. I think he’s pretty good with numbers and number patterns, too. If he’d been born at a different time or place, maybe he would have been a statistician or a hedge fund owner, creating some exotic string bean algorithm to produce great wealth for a select few. It didn’t work out that way for Uncle Bob, but I’d say his life has been pretty rich. Rest up today, Uncle Bob! This entry was posted in Today We Rest and tagged Baseball, Baseball America, late summer garden, real people in the real world, string bean algorithm, sunflowers, Uncle Bob doesn't have a hedge fund. Bookmark the permalink. Why are the numbers down? That’s what matters. Is it something that can be fixed? That’s where Uncle Bob’s experience comes in. Milk it. Notice the font on the masthead of Baseball America? Not very American, is it? Kind of like printing Southern Culture in fraktur. We’ve had a few discussions about this, LP. We think it was the periods of intense heat at critical points, coupled with periods of massive rain. Interesting comment on the font.